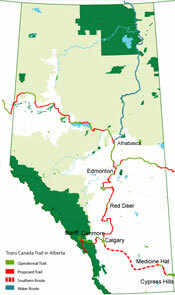 Alberta TrailNet is responsible for implementing the 2,960 km Trans Canada Trail (TCT) route in Alberta. To date, 1,700 km or 58% of the TCT route is in operation (including portions of the Arctic land and water route as well as the main east-west trail route through this province). From east to west, the Trail enters Alberta from Onion Lake, Saskatchewan. From there, it travels west along Alberta’s Iron Horse Trail, making its way to Fort Saskatchewan and Edmonton. The route then splits, heading north and south. The westbound route heads south to Calgary and then onwards through the Rocky Mountains to British Columbia. The TCT route to the Arctic Ocean heads north to Athabasca where it splits, with the Arctic land route connecting through northern BC to the Yukon, and the Arctic water route connecting via the Athabasca and Slave Rivers to the Northwest Territories. The northern land and water routes meet again at Inuvik in the Northwest Territories and continue from there to Tuktoyaktak on the Arctic Ocean. 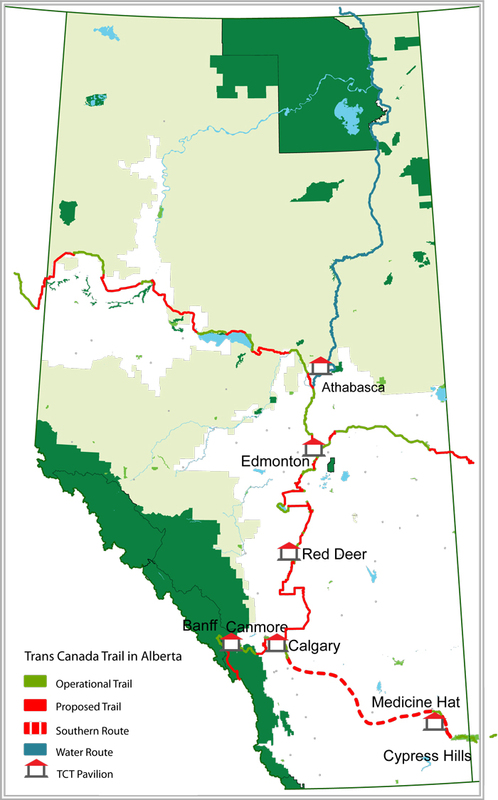 The Trans Canada Trail in Alberta includes a Southern route, which travels South from Calgary to Medicine Hat and Cypress Hills Interprovincial Park, then East to Regina, Saskatchewan, where it reconnects with the main route of the Trans Canada Trail. If you would like to know more about the completed sections of the Trans Canada Trail in Alberta, please see our Fact Sheets. Click here to view a PDF of the Alberta map.